The person engaged in shepherding ministry may be the pastor of a church, an elder in the church, a small group leader, a Sunday School or Bible study teacher, a discipler, a mentor, a parent, etc. 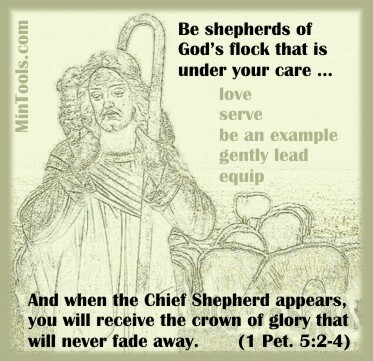 Anyone doing shepherding ministry is ultimately responsible to the Chief Shepherd (1 Pet. 5:4). First and foremost, this person, also a sheep, must be part of God's flock through a personal relationship with the Chief Shepherd, Jesus Christ. Loving the Chief Shepherd is a primary qualification for tending to His sheep (Jn. 21:15-17). Tending to the spiritual welfare of believers over the course of time by watching over, guiding, and nurturing them, is intended to help the sheep become more Christ-like. The Shepherding Ministry Manual briefly comments on each of the above responsibilities. In addition to this content, the manual also guides you through a study on the qualifications that should be in "shepherds of God's flock" based in 1 Peter 5:1-4 and thus incorporated into their ministry description.